Okanagan Vacation Home Rentals specializes in Vacation Homes, Lakefront Properties, Resorts and Condo rentals for your family holiday or business needs. Imagine yourself, your family and friends enjoying a large lake-shore home in Kelowna or spending a week in a world class luxury resort. Offering executive suites for your next business retreat, conference or stopover, Okanagan Vacation Home Rentals can accommodate any budget and time requirement. Planning your vacation should be simple, fun and exciting. It shouldn’t be hours and hours of scouring websites for information. Let us do the work for you. You make the call, we’ll do the rest. Make your getaway memorable by staying at one of popular summer destinations such as Kelowna, which offer great access to Okanagan Lake, Penticton which is surrounded by world-class wineries or Vernon which provides easy access to several prime golf courses. 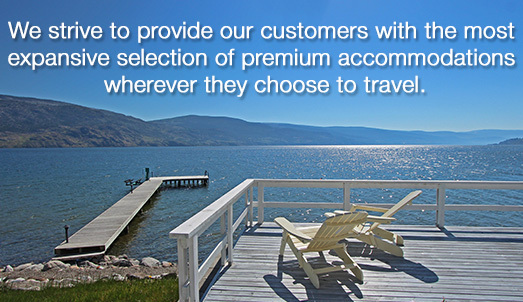 We also offer accommodations in Osoyoos, home of Canada's warmest lake, Shuswap area, one of the most popular summer destinations in British Columbia. Knowledgeable staff members are ready to assist with your enquiries about area amenities, visitor highlights and reservation information. Plan your vacation, annual family reunion, stopover, company training, workshop or retreat in one of Okanagan Vacation Home Rentals' properties amid the natural splendour of the beautiful Okanagan.